In honor of the month-long 3 minute shower challenge, we thought a post about sponges would be a great start to April! No need to go deep sea diving to find natural sponges, you can grow them in your own garden! Loofas, or Luffas, are part of the gourd family, and these long green fruit that look similar to zucchini grow well on trellises. Once the luffa has is fully grown, you can pick the fruit and peel the skin to reveal a bristle interior that makes a great kitchen sponge or skin exfoliator. Luffa seeds are available in most garden stores packaged in compostable paper. Each luffa pod will give you a good handful of seeds, so you should never have to buy seeds again after your first harvest! Luffas need between 150 and 200 warm days to ripen. In more northern areas like San Francisco, you may want to start your seeds inside a few weeks prior to planting time and then move them outdoors once the weather is nice and warm. I planted mine on March 9th in organic compost and covered in a light layer of mulch. 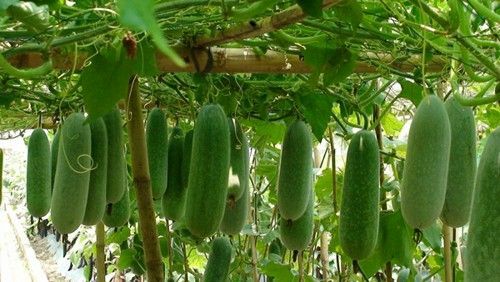 It was recommend to treat luffa plants like cucumbers, which like moist but well drained soil. It also likes to climb, so fences or trellises are great options. On March 26th, they sprouted! Your luffa are ready to pick when the skin turns dark yellow (or brown) and the fruit itself feels light, like it’s full of air. Allow fruit to grow on the vine as long as possible for sponge development. Important: Make sure pick any fruit before the first sign of frost! This is called powdery mildew, and the best way to stop it is to catch it early! I found a natural solution that works really well, using 3 ingredients you probably already have. This is a great opportunity to re-purpose a spray bottle.